Start Engaging With Your Prospects & Close More Deals! 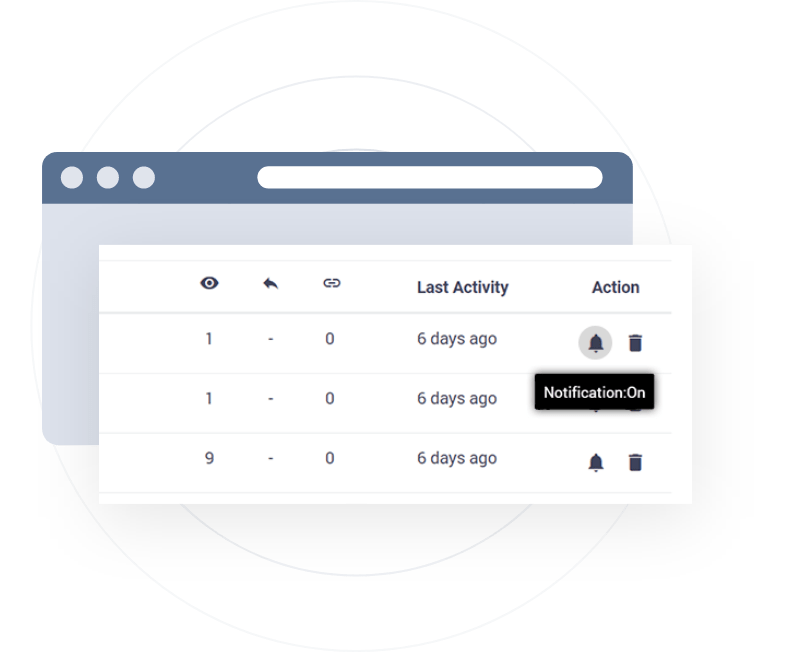 Get notified with desktop notification whenever your sent email has been opened/read by recipient. See when your email has been read last time in SalesHandy dashboard. Know how many times your email has been opened by the recipient. Also, get the history of email opens by your recipient. This Data will help you track your recipient’s interest level. Know which of your recipients have replied to your emails. 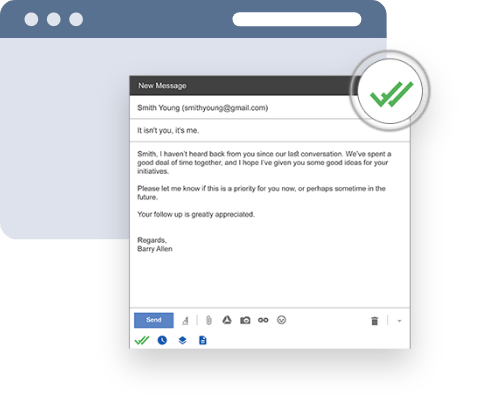 If your inbox has been flooded with tons of emails, this feature can help you to identify your important email replies. Export the CSV file covering the data of email tracking metrics like email open history, reply rate, link clicks, of each individual email that is sent by you. Get actionable data of total emails sent by an individual or team members in dashboard. Get No. of total emails sent, opened and replied with percentage. Track the link/links that you added in your individual email with link tracking feature. Enable the “Click and Link Tracking” option on your compose box to track the link. Get unlimited email open tracking for free! Insert email templates from the SalesHandy Gmail email tracking tool. Get template analytic to find which one of your template is working better. Share your email templates with your team & create personalized email templates as well. Schedule your Gmail emails to be send later using SalesHandy Email Tracking Plugin. Don’t wake-up at nights to hit send button, write when you are free and schedule it for an appropriate time. No need for time-zone converters, simply select the recipients time-zone and get you email delivered at right time. Mute the notification once the need for tracking gets over. Never get distracted by unwanted email opening notifications. Stop getting read receipts for email conversations which are less important. 1. HOW DO I KNOW IF MY EMAIL IS OPENED OR READ BY SOMEONE? This has been a old time issues people are facing i.e how do i know if someone has opened my email? There has been many solutions available since the long time back. SalesHandy is one of the PRO solution for this. One has to simply install an gmail email tracking plugin for the browser and can start tracking emails. SalesHandy gives some unique free email tracking features; not provided by everyone. It answer many questions at a time. If you are a sales guy or someone sending an important email, answer to below questions will help you a lot in taking decisions effectively. Is recipient opening my emails? What device recipient is using? How many times the email has been opened by recipient? What is the time your recipient is viewing you email? How to track email location of recipient? When my recipient has last opened my email? 2. HOW TO INSTALL FREE GMAIL EMAIL TRACKING PLUGIN? HOW TO CONNECT E-MAIL TRACKING IN GMAIL? Step 2: Click on Add to Chrome. Once you hit the URL or reach to SalesHandy e-mail tracking page. Press + Add to Chrome button & it will take you to the installation process. Note – If your Gmail account address is alex@abcxyz.com, the email address on your SalesHandy account should also be alex@abcxyz.com i.e both of your accounts should be of same email address. If you don’t have SalesHandy account proceed to step 4. Step 4: You will see a button on the right side of your Gmail interface saying “Activate SalesHandy”. This means that you don’t have an account in SalesHandy with the given email address. You can create a SalesHandy account by clicking here or hit “Activate SalesHandy” button on your Gmail interface. 3. 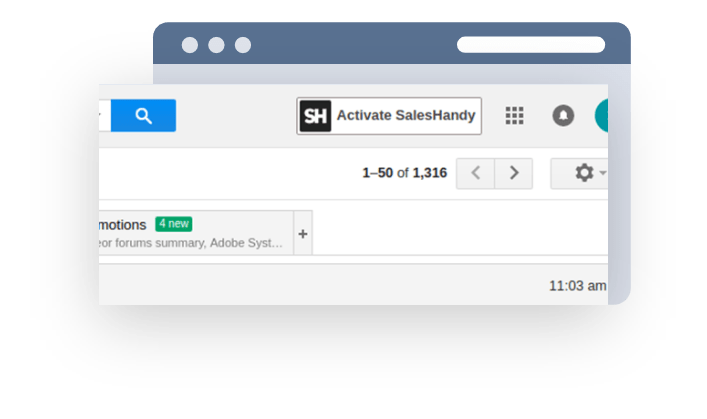 HOW DOES SALESHANDY’S EMAIL TRACKING PLUGIN FOR GMAIL WORKS? 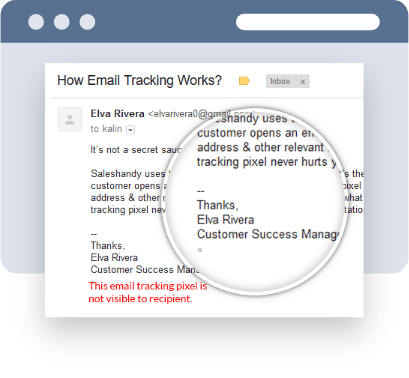 After installing SalesHandy Gmail plugin for Tracking e-mail, click on compose button & follow below steps to send a tracked email.While composing an email, select the double tick mark. The selected tick mark will turn into green color (As shown below in the screenshot.) Viz. the hidden email tracing pixel is placed in the body of the email. This will track the activities on that particular email. You have to just hit the tick mark every time you want to trace an email. Voila..! HOW EMAIL TRACKING CONCEPT WORKS? It’s not a secret sauce. At the time when you compose your email, click on the email tracking button (As shown below in the screenshot.) 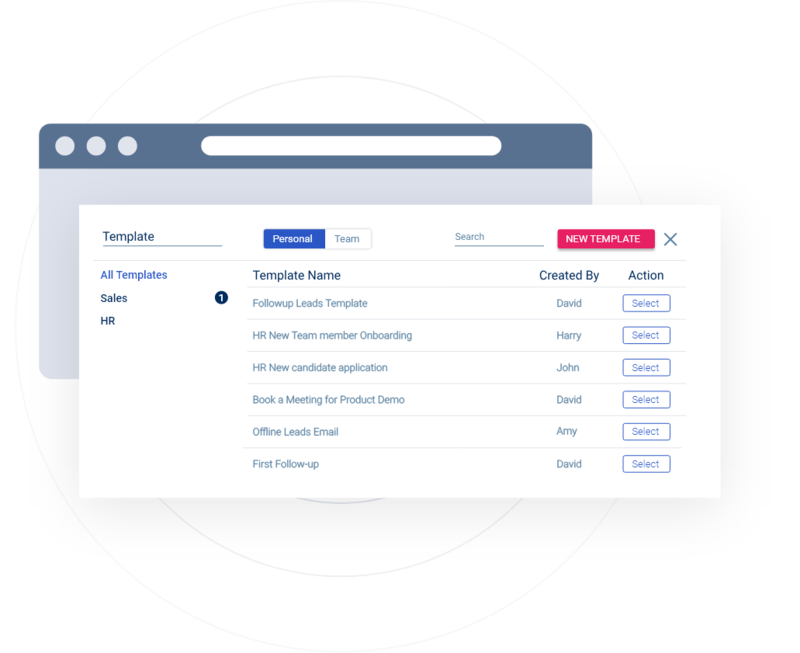 When the tracking button turns into a blue colour, your SalesHandy Outlook email tracking tool will be enabled to track your emails. SalesHandy email tracking pixel never hurts your spam score or email presentation. 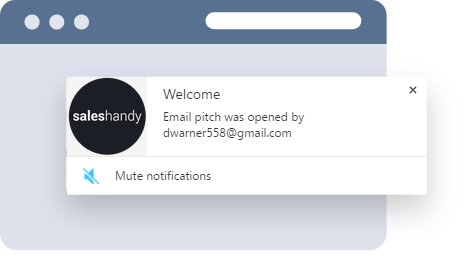 HOW YOU ARE GOING TO BE NOTIFIED WHEN EMAIL IS OPENED? 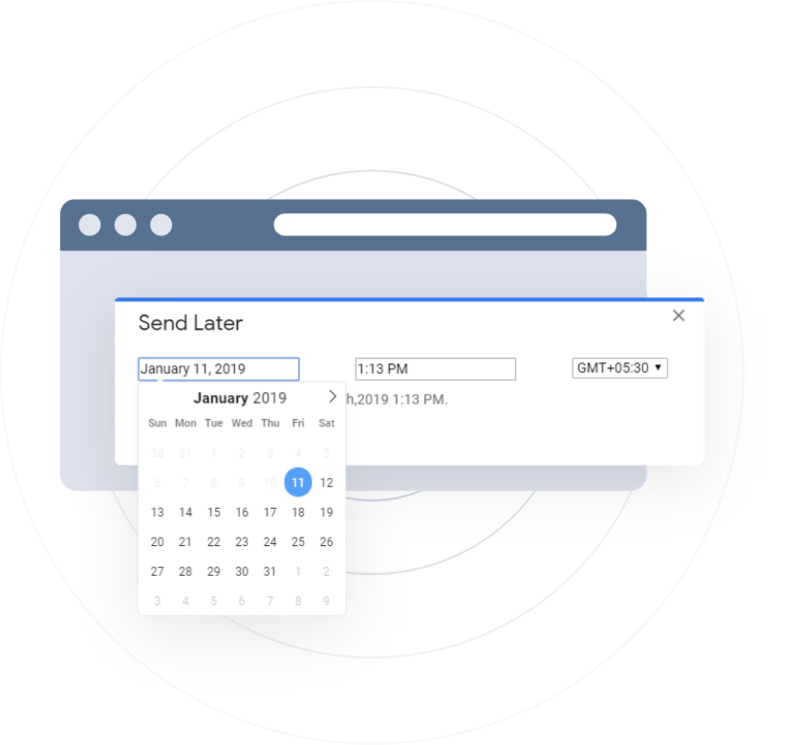 Now, as and when the email with tracking pixel is opened by the recipient, you will get a desktop notification (How to enable email notification for SalesHandy). Also, the same email opening activity will be registered on activity board of SalesHandy. Moreover, one can also see the list of all email sent & last opened in the email dashboard. 4. DOES GMAIL PROVIDES INBUILT READ RECEIPT / EMAIL TRACKING? This is what google says about email read receipts or email tracking gmail functionality. Still, if you want to have read notifications for the emails you send; Go on and add SalesHandy Gmail email tracking plugin. 5. WHO CAN ALL USE EMAIL OPEN TRACKING? SALESHANDY IS MADE FOR WHOM? Sales executives and inside sales team who want to close more deals. Sales Professionals who want to boost their email productivity. Business Development team & Project managers who are constantly coordinating teams. A Startup or an entrepreneur who is constantly emailing pitch decks to investors. A marketer who wants to increase outreach. Start tracking your emails today. 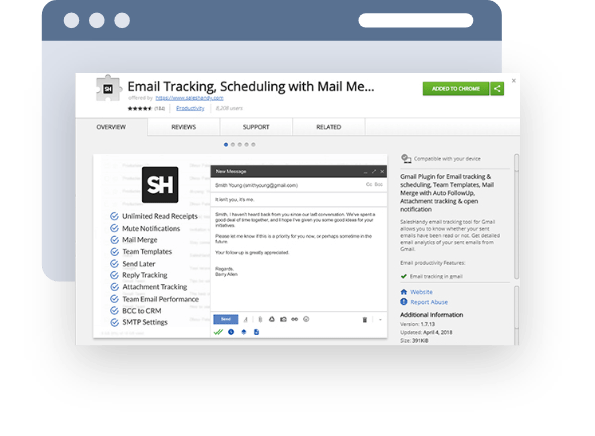 Get unlimited email tracking for free!